Phonographic Copyright (p) – Williams, Bell & Assoc. Inc.
Phonographic Copyright (p) – Nintendo Of America Inc.
Phonographic Copyright (p) – 4Kids Entertainment, Inc.
Phonographic Copyright (p) – Cherry Lane Music Publishing Company Inc.
Phonographic Copyright (p) – YTV Productions, Inc. Copyright (c) – YTV Canada, Inc. Licensed From – ISBA Music Entertainment Inc. Licensed From – Sony Music Entertainment (Canada) Inc. Licensed From – 4Kids Entertainment, Inc.
Record Company – Corus Entertainment Inc. Published By – 19 Music Ltd. Published By – Warner/Chappell Music Canada Ltd. Published By – Mentalcase Music Ltd.
Track 1 [published by] Sony/ATV Music Publishing (UK) Ltd. / 19 Music Ltd. / BMG Music Publishing Ltd. / Universal Music Publishing. ℗ 1999 S Club Ltd.
Track 2 [published by] Violent Publishing. ℗ 1998 Breakin' Records / Violent Music. Courtesy of ISBA Music Entertainment Inc.
Track 3 [published by] Cheiron Songs / BMG Publishing. ℗ 1998 Trans Continental Records, Inc. Courtesy of BMG Music Canada. Track 4 [published by] Sugar Free Music / Bucks Music / 19 Music Ltd. / BMG Songs / Chyrsalis Music / Songs Of PolyGram Int'l, Inc. (BMI). ℗ 1998 Sony Music Entertainment (UK) Ltd. Courtesy of Sony Music Entertainment (Canada) Inc.
Track 5 [published by] Air Chrysalis Scandinavia / Murlyn Music (ASCAP). ℗ 1999 Motown Record Company. Track 6 [published by] Shark Media Songs / Warner Chappell / Humassive Music (ASCAP) / Maxximum Songs-Maxximum Music (GEMA). ℗ 1999 Maxi Media Productions / Williams, Bell & Assoc. Inc. under exclusive license to EMI Electrola GmbH. Courtesy of EMI Music Canada. Track 7 [published by] Not Enough Music / Lewkayo Space Music (SOCAN). ℗ 1999 Universal Music. Track 8 [published by] Erotica Music / Warner Chappell Music Canada Ltd. (SOCAN). ℗ 1999 Universal Music. Track 9 [published by] Treyball Music / Slamuwell Prod. / Jelly's Jams LLC / Warner-Chappell / Bernard's Other Music / Sony-ATV Songs / Gambi Music (BMI). ℗ 1997 Sony Music Entertainment Inc. Courtesy of Sony Music Entertainment (Canada) Inc.
Track 10 [published by] Windswept Pacific Music Ltd. / BMG Music Publishing Ltd. ℗ 1997 Virgin Records Ltd. Courtesy of EMI Music Canada / Virgin Music Canada. Track 11 [published by] Weindorff Music / Hi Lamont Publishing (SOCAN) / Partners Music (ASCAP). ℗ 1999 All Media Entertainment. Courtesy of KOCH Records. Track 12 [published by] MeMilo Music / Mentalcase Music / Sony-ATV Music Publishing Canada. ℗ 1998 Sony Music Entertainment (Canada) Inc. Courtesy of Sony Music Entertainment (Canada) Inc.
Track 13 [published by] Boomtang Music (SOCAN). ℗ 1999 EMI Music Canada. Courtesy of EMI Music Canada / Virgin Music Canada. Track 14 [published by] WB Music Corp. / Warner Chappell Music Denmark (ASCAP) / MCA Music Publishing, a division of Universal Studios, Inc. / MCA Music Scandinavia AB (ASCAP). ℗ 1997 MCA Records, Inc.
Track 15 [published by] mytown's own music / EMI Blackwood Music Inc. (BMI/IMRO). ℗ 1999 Universal Records, Inc.
Track 16 [published by] Windswept Pacific Music Ltd. / 19 Music Ltd. / BMG Music Publishing Ltd. admin. by BMG Songs, Inc. (ASCAP). ℗ 1999 EMI Records Ltd. Courtesy of EMI Music Canada. Track 17 [published by] Universal/Union Songs AB. ℗ 1999 Stockholm Records. Track 18 ℗ 1999 Nintendo Of America Inc., 4KIDS Entertainment, Inc. & Cherry Lane Music Publishing Company, Inc. Courtesy of 4KIDS Entertainment, Inc. / KOCH Entertainment LLC. 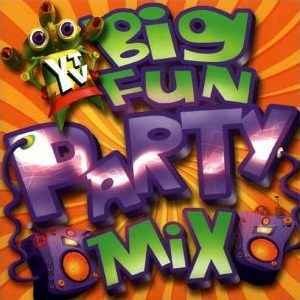 Track 19 ℗ 2000 YTV Productions, Inc.
© 2000 YTV Canada, Inc. A Corus™ Entertainment company. This compilation ℗&© 2000 Universal Music, a division of Universal Studios Canada Ltd. Manufactured and distributed in Canada by Universal Music.